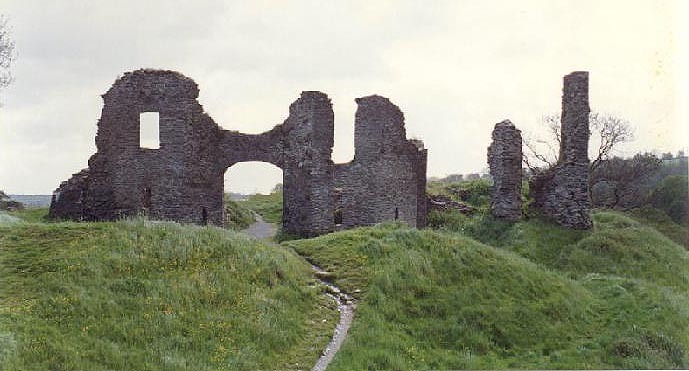 he time-worn remains of this castle, on a picturesque, grassy site overlooking a loop on the River Teifi, were once inhabited by, amongst others, Sir Rhys ap Thomas, friend of Henry VII. It would be hard to imagine a more serene setting than this, and one is not surprised to find that it was once intended as a county seat rather than a military post. Yet it had its share of excitement in the Civil War, when held for the king and blown up with gunpowder at the close of the struggle. There are remnants of some of the walls and the ruins of the gate. It is significant as the only native Welsh castle to be built in stone in this part of Wales. The castle was probably founded by Maredudd ap Rhys around 1240, and if this is so, it is one of the few castles in Dyfed built by the Welsh in stone. His son, Rhys ap Maredudd, held the castle in 1287, and the castle changed hands three times during his successful revolt against the English crown from 1287 to 1289. After Rhys had finally been defeated and killed, the castle became crown property and remained so until 1349. During this time, three refurbishments are recorded, during which this time the gatehouse was constructed and a new town was founded outside the castle walls. 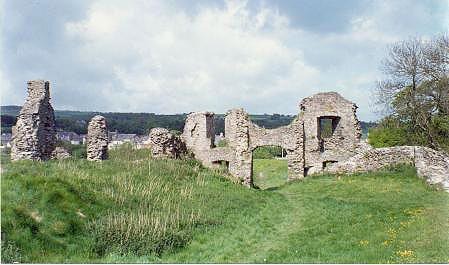 In 1403 the castle was taken by Owain Glyndwr, but was described as being in ruins by 1428. 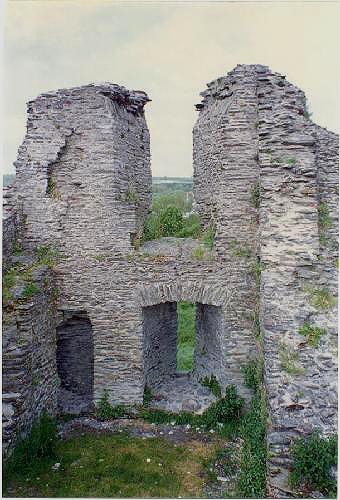 Sir Rhys ap Thomas acquired and repaired the castle in about 1500. It changed hands a number of times before the Civil War during which it was held by Parliament until its capture by Sir Charles Gerard in 1644. Major-General Rowland Laugharne besieged it for Parliament in 1645 but was routed by Gerard in a fierce engagement below the castle walls. After the general surrender of the Royalists, the castle was blown up to make it indefensible and, according to a source of 1700, the castle was plundered and ever since neglected. The twin towered gatehouse, which stands on the west side of the triangular inner ward, is the dominant feature of the castle. According to a record of 1336, its construction was begun in the reign of Edward II (1307-27) but it was not completed until 1349. Much later, about 1500, it was altered by Sir Rhys ap Thomas who inserted the large windows, as by then defence was of less importance than comfort. The gatehouse towers are semi-octagonal outside and rectangular internally and have latrine shafts on the north and south which may be later insertions. In the floor of the north gatehouse room is a manhole cover which blocks the slanting entrance passage of an extraordinary well-preserved vaulted cellar. Access to the upper floor of the gatehouse was via an external stair adjacent to the east wall of the north tower, which may have also served as an access stair to the wall-walk on the curtain wall. South of the gatehouse are two blocks of masonry which belonged to a square tower, probably 14th-century in date like the gatehouse. A length of ruinous curtain wall runs from the tower along the south side of the inner ward for some 23m. The inner ward curtain wall followed the slope of the promontory and further fragmentary sections have been excavated at the east end. From a survey of 1532 we know that the hall lay near the gatehouse, probably on the south side. The survey further tells of a chapel which adjoined the hall and lay at first-floor level over a kitchen and larder. Another large building was apparently situated on the eastern side of the castle. No traces of these buildings remain above ground level.